There is no doubt about it, first impressions count. Some people spend thousands of dollars trying to get the interior of our homes looking like something out of a glossy magazine, but they often neglect the outside of the house. Choosing the right style, color and material is important, and it can positively affect the perception of your home. The color of your garage door should always compliment the rest of the exterior of your home. While you don't necessarily need the panels to be the exact color as the rest of your home, it is a good idea to at least have a similar shade or tone. This can make your garage door a focal point without looking like it is out of place. The style of door you choose should also add to the curb appeal of your home so make sure you choose one that fits the house's overall appearance. If you are planning to sell your home in the near or slightly distant future, this can greatly increase its monastery value. Even the simplest garage door can look stunning with the right features. You can add some lighting around the frame of your door or you can add a different colored border. Both of these features will not only make your garage door the stand out, it will also add a little charm to the street appeal of your home. You can also install motion sensor lighting, which will serve both as a security addition as well as a safety enhancement. If your old garage door has seen better days, you may want to consider replacing it. A door with faded or chipping paintwork looks neglected and messy, and is more than likely not providing you with the proper level of security and insulation that you deserve. A new door will make your home really "pop", and if you choose one with a high R-value and with strong foundation of material, you'll be able to make your home more energy efficient and secure. Having a stunning home that stands out from the rest of the houses in the street is all about combining colors and textures. Even more important is maintaining an appearance of tidiness and wholesomeness. 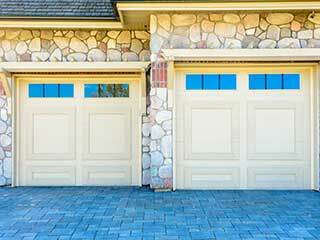 Clean your garage door regularly to keep it looking newer for longer. If you have any questions, feel free to reach out to our team at Garage Door Repair Oceanside.